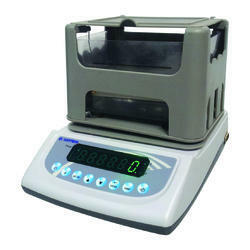 We are the leading manufacturers and exporter of Gold Purity Checking Balance and our product is made of good quality. Our balance is available in various sizes as per customer requirements. Measurement based on Archimedes’ principle incorporating High Precision electronic weighing scale. Accurate, Reliable and nondestructive testing method. Provision to enter water temperature for temperature compensation of density value. Over load and shock load protection for weighing scale. Display of gold purity in % as well as carat. Gold purity checking in gold-copper-silver, gold-silver, gold-copper alloys. Can be used to check other precious metals like platinum, palladium etc. by using mixture proportion function. RS-232 interface for printer / computer connection. Spacious tank for big ornaments, the special design of tank to reduce buoyancy error. Hollow ornaments, ornaments inlaid with stones cannot be checked. We are the leading manufacturers and exporter of Gold Purity Checking Instruments and our product is made of good quality. Display of gold purity in % as well as karat. Can be used to check other precious metals like platinum, palladium etc. by using mixture proportion function. Looking for Gold Purity Checking Instruments ?